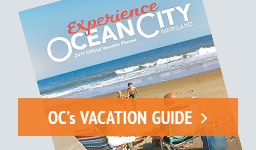 There are an unlimited number of things to see and do in Ocean City, and getting to and from those destinations and attractions is easy, thanks to our many public transportation options. See also the Town of Ocean City government website. See also Ocean City Municipal Airport. The regional airport is located south of Route 50 approximately 30 minutes away from Ocean City, off Walston Switch Road, just east of Salisbury. American Airlines offers regularly scheduled flights to and from Philadelphia and Charlotte. This is not a complete listing of all houses of worship in the area. Please consult local papers for additional listings and service times. Access to the beach for the physically challenged is provided at certain locations along the beach and is designated by a blue sign on street entrances along Coastal Highway. N. Division 12th St., 25th St., 35th St., 37th St., 40th St., 48th St., 59th St., 70th St., 81st St., 89th St., 94th St., 107th St., 120th St., 130th St., 139th St., 145th St.
Beach wheelchairs are provided on the beach at certain locations by the Town of Ocean City from Memorial Day through Labor Day, from 10:00 a.m. to 5:00 p.m. daily. When using one of the beach wheelchairs, it must be used within one block (one north and south) of where the chair is assigned and kept. Beach wheelchairs are available on a first-come-first-served basis from the attending beach patrol and must be returned by 5:00 p.m.
Beach Wheelchair locations are subject to change pending availability. Inlet Lot, 7th St., 27th St., 30th St., 40th St., 48th St., 59th St., 70th St., 81st St., 89th St., 94th St., 107th St., 120th St., 130th St., 139th St., 145th St.
*This may not be a complete listing. Additional Beach Wheelchairs at the locations below may be available year-round pending availability. Beach wheelchairs are available from the Ocean City Visitors Center in the Roland E. Powell Convention Center on 40th St. for one to three days of use by advance reservation. Certain restrictions may apply. Please call (410) 289-2800. In order to preserve the quality of the beach wheel chairs, they may not be wheeled away from the Convention Center to the destination. Wheelchairs must be picked up by either SUV or truck that can accommodate them (they do not collapse). Beach wheelchairs are not to be taken into the water and are to be used only on the beach. Ocean City Park & Ride, Rt. 50 (West of Harry Kelley Bridge): Free parking, $3 shuttle bus. 100th St. Parking Lot, bayside: Daily or Weekly (credit card only). 100th St., bayside. - This is also a boat trailer approved lot. Fee for this lot is $10.00 a day or $50.00 a week, April 1st – October 31st. You will also see additional street side Cale pay station parking on selected streets, oceanside and bayside in the areas between S. Division St. and 10th St., and again at 99th St. Ocean City offers electronic vehicle charging stations at these locations. See also OC Local Parks & Playgrounds. Inlet Park: Southernmost park with viewing binoculars and information signs. Ocean City's time capsule located here. Downtown Recreation Complex - 3rd St., bayside: Basketball courts, ballfields, skate park, (in-line skating and skateboarding), 2 tennis courts, playground equipment, area for fishing in bay. Robin Park - 28th St.: Landscaped open space, playground equipment. Ocean City Tennis Center - 61st St.: Lighted tennis courts, 6 Premier Courts, 3 Lee Fast-Dry clay courts. Little Salisbury - 94th St. Park, Bayside (next to Art League building): Tennis courts, playground, basketball court, dog playground. Jamestown Park - Landscaped promenade off 116th St., bayside. Northside Park - 125th St, bayside: 58 acres with lighted ball fields, fishing lagoon, ADA accessible playground, picnic area, two piers, jogging paths, sports fields, indoor gymnasium. Gorman Park - Derrickson Ave. at 136th St., bayside: Tennis court, racquetball court, playground and picnic shelter. Fiesta Park - Off 141st St.: Wooded park with nature trails and picnic area. Northsurf Park - Laurel Rd., bayside (Off 142nd St.): Open space for picnics, tot lot. Sunset Park - S. Division St., bayside: Promenade with views of the bay and Assateague. For complete information, contact the Recreation and Parks Office: (410) 250-0125. See also Sports & Recreation. 3rd St. and St. Louis Ave.
*Reservations needed Memorial Day through Labor Day Call (410) 524-8337 for Tennis Court Reservations. Visit the Town of Ocean City Recreation & Parks page. For sports enthusiasts, the Ocean City Recreation and Parks Department operates a variety of activities to keep fit and have fun. Tennis: Courts are located bayside at - 3rd St., 61st St., 94th St., and 136th St.
For more information, or to reserve a tennis court, call (410) 524-8337 in season. Racquetball - 136th St., Gorman Park, bayside: One 3-wall court. Skate Park - 3rd St. & St. Louis Ave: Open year-round. Call (410) 289-2695. Basketball: Courts are located at 4th St. & St. Louis Ave; 94th St., bayside; 125th St., bayside (indoor). Volleyball: Nets are available at the Inlet, 2 nd St., 4th St., 5th St., 7th St., 9th St., and 11th St.; and 10 courts at Dorchester Street. Volleyball nets will be set up on the beach for summer. Open to everyone at no charge. Golf: Eagle's Landing off Route 611. (410) 213-7277. Other sports facilities are available. Certain fees and restrictions may apply. Please call (410) 250-0125 for details. See also Public Boat Ramps. All locations are accessible for the physically challenged.